This prickly plant, also called the screw pine, grows long leaves that arch attractively outward from the center. Its botanical name is Pandanus veitchii and its common name is somewhat misleading: The screw pine is actually not a pine, and its name comes from its leaves’ slight resemblance to those of a pineapple. Though these leaves spiral nicely, they have rows of sharp, hooked spines running up the sides that can be nasty to touch. P. veitchii is a good grower that adapts well to different circumstances, and will eventually grow over four feet tall if properly maintained. Its leaves also grow fairly long: up to three feet. Light: Lots of direct light is good, but the plant can survive dappled shade as well. Water: Water it thoroughly but sporadically. Its soil can be allowed to dry on the top layer, but should never dry out completely. P. veitchii needs more water during its growing season in summer, after which its water can be scaled back. Temperature: Warm temperatures above sixty degrees. Not frost tolerant. Soil: This plant isn’t picky about its soil requirements. It responds well to the slightly sandy potting soil. Fertilizer: Feed biweekly with a balanced houseplant fertilizer during the spring and summer. During the dormant season in winter, you only really need to feed it about once a month. The screw pine propagates from its shoots, which can be severed in spring and replanted in a rooting medium like perlite or a mix of peat moss and sand. Make sure to keep the new shoots warm and humid: Cover them in plastic and leave them for a few weeks, and make sure to mist them regularly. P. veitchii should root fairly easily. Repot annually at the beginning of the growing season so the plant has room to expand, in early spring. Be careful not to damage its roots. P. veitchii’s roots will emerge from its base as it ages: When you repot it, simply cover the roots in the soil again and let them grow back. 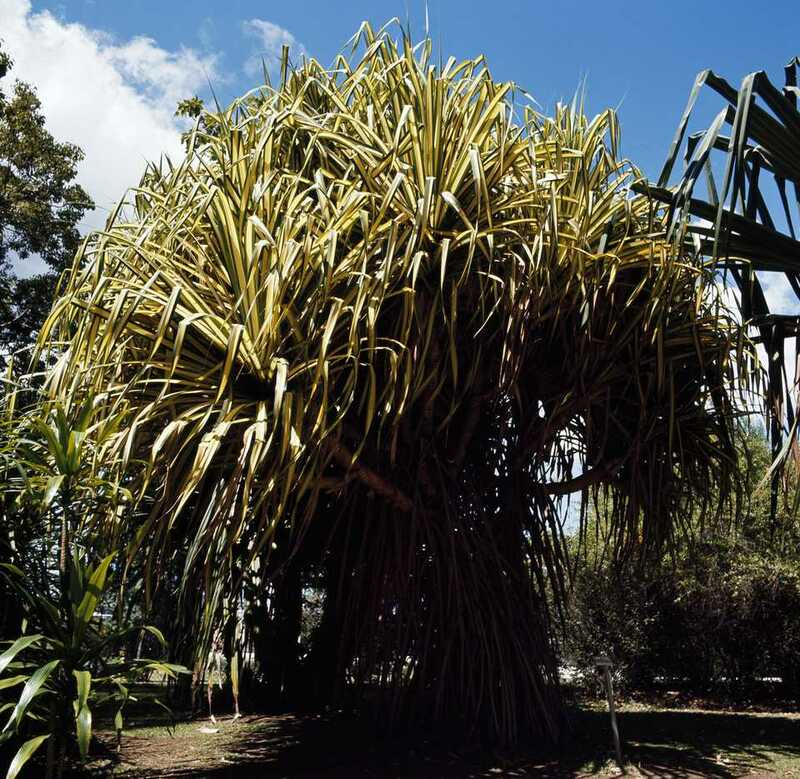 These aerial roots are designed to hold the plant upright and strong. By pushing them into the soil, you’ll keep your screw pine secure in its pot. P. veitchii is only one of many species of screw pines which are distributed across the world. Many of its cousins share its anchoring roots and sharp leaves. However, most are not commonly cultivated domestically. An exception is P. amaryllifolius, which is especially popular as a spice in Southeast Asian cooking. This plant should be kept in a room that receives lots of light and works best as a floor plant due to its size. Make sure and give its leaves lots of room to arch. If the screw pine doesn’t receive enough light, its leaves will turn wholly green instead of their normal pale bluish-green: this is a good diagnostic of whether you’re lighting it enough. Also, watch out for spider mites: If your plant does suffer from mites, the best way to deal with them is simply wiping them off with a wet cloth.